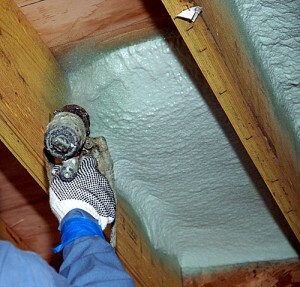 InsulStar is the most energy-efficient, environmentally friendly, closed-cell spray-in-place polyurethane insulation system available. It is formulated from renewable agricultural resources and is odorless and completely non-toxic after installation. 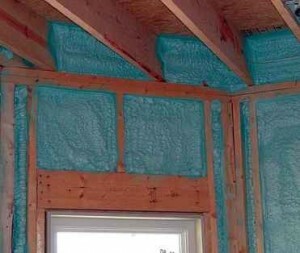 It stops air flow into and out of your home, reduces noise, blocks dust, pollen, and other airborne pollutants for a more comfortable environment. By designing and building a highly energy-efficient home, the reduction in energy demands for heating and cooling will lower demand on utility companies for the life of the house. With InsulStar you can insulate directly to the roof deck, bringing all of the space under the roof into use. By putting HVAC ductwork in conditioned space, energy waste from leakage is eliminated. The additional conditioned space can then be utilized for computer rooms, bonus rooms, play rooms, or closet space. Previously wasted attic areas become valuable living space for very little cost, while adding tremendous retail market value to the house. InsulStar can be applied to the underside of roof decks to form conditioned or cathedralized attic areas. For more information, please visit InsulStar’s website here.